UK based catfish aficionado Richard Broadbent provides the lowdown and his personal experience of keeping this attractive mid-sized catfish. A 'pim' or not a 'pim'? Well, not a 'pim' (from the pimelodidae) but actually but a member of the catfish family heptapteridae. Both families come from South America and are physically very similar. They both have three pairs of long barbels, they are both scaleless; without armour plates. Both families are carnivorous, although the species in heptapteridae are much more suitable to keep in the average catfish enthusiasts tanks. Some 'pims' can get to over 5 feet (TL) whereas luckily, heptapterids are a much more manageable size. Goeldiella eques will reach just over a foot long (TL) and has a pleasant body pattern and colouration. The base colour ranges from a pale creamy brown, to darker hues of olive-green or brown or occasionally a golden tinge. There is generally a broad darker stripe along the length of the body & a near vertical dark shoulder stripe that extends into the front of the dorsal fin. There are often other small dark spots on the upper part of the body. Aquarium specimens seem to stay lighter in colour than some newly captured fish shown in photos on the web, but this can be said for many species. The head is reasonably large in comparison to the body which no doubt helps give rise to the infrequently used common name of horseface catfish. The tail is rounded and the adipose is long and shallow. Identification should not be a problem with this species. That said, the African claroteid, Chrysichthys ornatus, has a very similar appearance although the head and body are somewhat flatter. The case of a parallel evolution can be found discussed in literature although Chrysichthys species have four pairs of barbels. 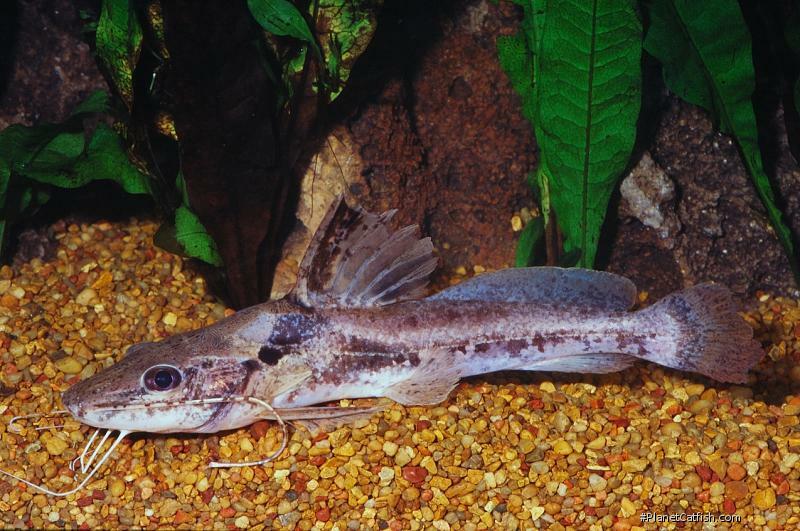 C. ornatus also differs from our South American catfish in having a forked tail, much shorter barbels and a much smaller adipose fin so these species really shouldn't be confused. Back to Goeldiella: This species is not seen often - back in the 80's you'd see one once in a while but here in the UK I've not seen them for sale recently. I've only seen one for sale at a specialist store but I do understand they are appearing in the US at the time of writing. It is however a great fish to keep despite these availability problems. It is unfussy at feeding time and will readily take sinking pellets. Earthworms are a particular favourite and are positively wolfed down. Seafood items like shrimp, cockle and mussel are eaten but they didn't relish them as I'd expect. A little bit of thought and consideration should be given to tankmates. Do you want to attempt to breed them? If so, then avoid anything aggressive or that might predate upon fry. Do you want the other tank mates to not get eaten? Then peaceful larger bodied fish should be chosen as this fish has a good sized mouth. Tank size needs to be something like a 4x2x2 foot as a minimum but the bigger the bigger the better. They can be a little boisterous with each other & squabbles do break out now and then but I've not seen serious damage inflicted on one another. They do need a number of hiding places in the tank, but this does not necessarily mean caves; gaps between rocks or under submerged branches can easily be used to give a feeling of security for them. Nothing is known about breeding this species in captivity, so it would make a great challenge for the dedicated hobbyist. Individuals can be readily sexed based on genital papillae (detailed in the Cat-eLog) and it would appear than males are generally smaller than females. Given the appearance of this species 'across the pond' maybe someone will make a serious breeding attempt with these and with a bit of luck, this article will need to be updated! Size 289mm or 11.4" SL. Find near, nearer or same sized spp. Distribution South America: Guyana and Amazon River basins.